Conair extends the legacy of the patented Drying Monitor with the introduction of the DM3-i. Drying performance analysis occurs inside the drying hopper providing you with early detection of poor drying conditions and allowing you to correct potential issues before you have processed improperly dried material. With the DM3-i, you will have control of polymer drying, make defect-free parts, save energy and increase your profitability. 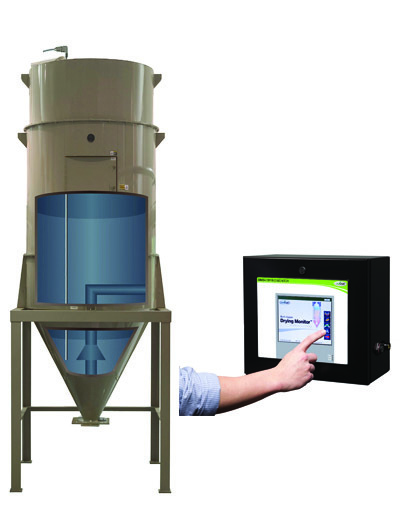 Now available as an independent touch panel, the DM3-i model can monitor up to 30 hoppers – even non-Conair hoppers. The DM3 is also available as a dryer option, embedded into the dryer control. Contact Conair for more information on the DM3-e or DM-II. The DM3 monitors the temperature profile inside the drying hopper. Any out-of-spec temperature zone reading that may lead to incorrectly dried material is shown for immediate correction. Any size hopper, of any brand may be easily fitted with a Drying Monitor Probe to report on the state of your drying process, at any time. Unobtrusive, smooth, one piece, stainless steel Drying Monitor Probes are sized for each drying hopper so they can relay precise readings of 6 crucial temperature zones in the drying hopper to the DM3-i TouchView Panel. Hopper probes may be supplied straight or angled to accommodate loading equipment. The exclusive adaptor plate allows for secure installation of the probe down from the top or up from the inside of the hopper. Up to 30 hoppers are displayed and easily accessed for review or changing settings on the graphical touchscreen interface panel. Each hopper being monitored by DM3-i will display its critical drying temperature profile for examination and trending, and most importantly, assuring proper drying is taking place. When temperatures are not what they should be, Drying Monitor will be first to let you know with a flashing alarm banner and listing the alarm by date and time in the alarm log.